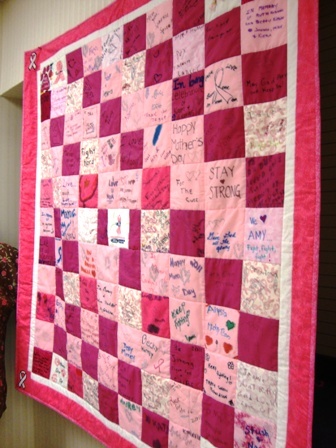 I received word that one of my breast cancer quilts has been placed in Strecker Cancer Center at Marietta Memorial Hospital in Marietta, Ohio in honor of Breast Cancer month. I understand that it will be traveling around a few offices there. I'm so glad that others will be able to read the messages on the squares that were sent to me to sew together. The quilt is really basic but the messages are so powerful. Here's a few photos from the dedication that I did not attend. 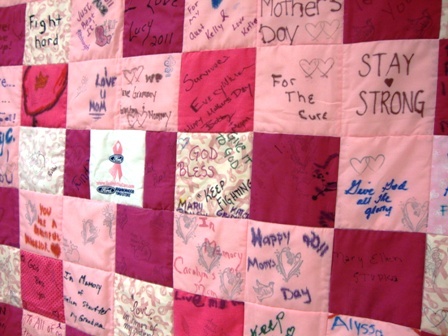 I also learned that the second one will be dedicated to a clinic in West Virginia.